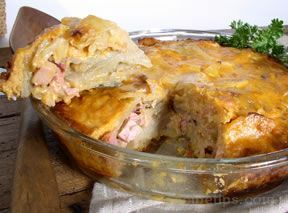 Leftover ham never tasted so good. These potatoes with a light cheese sauce will comfort you from the inside out. Serve it with a green vegetable and some crusty bread. 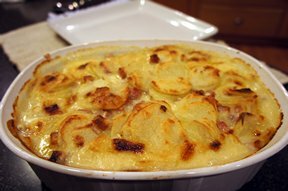 Combine all ham and potato ingredients. Layer in a 2 quart greased casserole dish. For sauce, melt butter in a saucepan. Add flour and cook for one minute until smooth. Add milk, dry mustard and cheese. Cover over low heat until cheese is melted. Pour cheese sauce over potato mixture. Bake for 1 hour or until potatos are done. 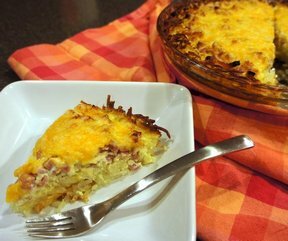 "This is absolutely delicious and easy to make! The only suggestion I have is to use less onion than it calls for." 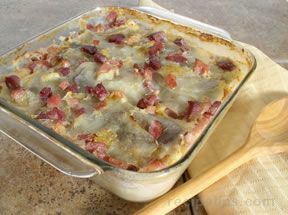 "Great scalloped potato and ham recipe! I cooked it for an hour and the potatoes were still slightly undercooked, but I actually preferred it that way. Be sure to add salt and pepper to the sauce."